The Say: You can enjoy the drive with the added trunk. Although the sedan body of the WRX and WRX STI exist, a regular non-performance version of the Impreza compact was introduced for the first time. 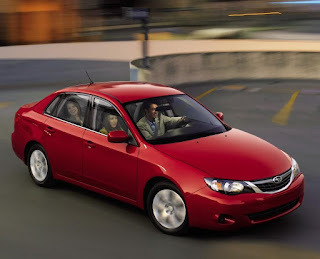 The regular sedan and its WRX counterpart was launched first in April 2009 while the WRX STI replaced its lowly brother in November 2010 through a facelift model. Do take note the regular R Sport model was replaced by the fourth generation model in 2012 while the WRX STI stayed until 2014 (by that time, it had dropped the Impreza name). Depending on what you need, either a 2.0 or 2.5 turbocharged (with varying horsepower figures) engine is offered. The 2.0 models have a cruiser car-like personality since reaching upper revs will have the engine complain although this will unleash the vehicle's power. Choosing the 2.5 for the WRX and WRX STI models have different horsepower figures, with the WRX being quick but not scary quick for first timers and the STI packing that adrenaline rush. Since all cylinders are positioned horizontally, it feels balanced at any speed without that outside noise due to high levels of insulation. When it comes to driving this vehicle, it is a joy to drive and the suspension does not give passengers road imperfections that are transmitted (WRX and WRX STI models gain a different suspension setting) but fuel consumption is poor, due to a standard all wheel drive system. Excellent interior quality greets occupants of the Impreza, alongside cabin space good enough for four people. When it comes to cargo carrying, the sedan has a shallow trunk which limits its capacity. The R Sport is the regular version packs a 152hp 2.0 engine paired to an automatic transmission, all power amenities, dual airbags, ABS brakes, CD player with MP3 and auxiliary jack, stability control, fog lamps, rear spoiler, 60/40 fold rear seat, automatic climate control, alarm, keyless entry, and steering wheel audio controls. WRX models get a 230hp 2.5 engine and some exterior revisions plus it is only available with a five speed manual while its replacement, the WRX STI have 300hp paired to a six speed manual, side airbags, leather seats, cruise control, Brembo brakes, and some revisions inside and out. Prepare to shell out more than your average Japanese compact when it comes to maintaining one especially that Subaru maintenance is a bit higher plus the standard all wheel drive will make fuel consumption high. Although there are no reported issues with R Sport Imprezas, WRX and WRX STI have turbo issues so do inspect that one thoroughly. If fuel consumption is a priority, there are other better choices.